A round of golf at Heritage Harbor wouldn’t be complete without picking up a golf shirt to take home with you. You’ll want one with the Heritage Harbor logo on it – the trademark cupola or gazebo from the top of the clubhouse building. Heritage Harbor pro shop carries several manufacturers of women’s and men’s golf clothing so that you can play your round in style: Cutter & Buck, Greg Norman, Sport Haley, Izod Club and Callaway to name a few. 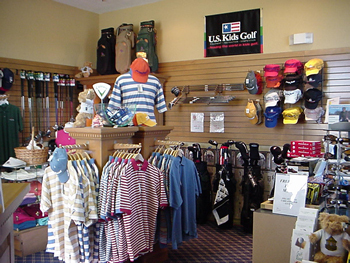 The pro shop is fully stocked with other various golf essentials such as gloves, shoes, hats and balls. Also if you are in the market for clubs, Heritage Harbor pro shop provides clubs for all ages from its lines of Yonex, Titleist and U.S. Kids. For more information call the pro shop at 813-949-4886 or send us an e-mail with your request or question. We do accept phone orders and special orders are available.